I have a huge event planned tomorrow. I am raising money for St Jude!! What is St Jude? St. Jude is a leading children’s hospital pioneering research and treatments for kids with cancer and other life-threatening diseases. So what am I doing to raise money? 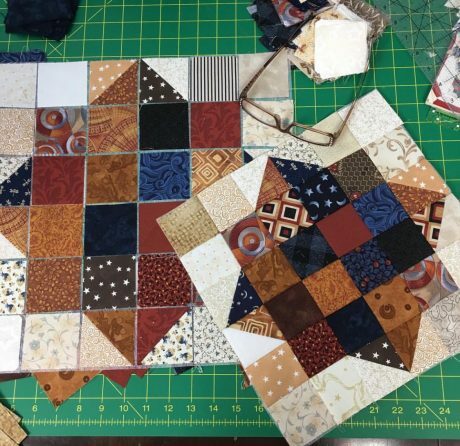 I am doing a marathon stream on my Twitch channel where I will be making a lap quilt completely start to finish in one day. 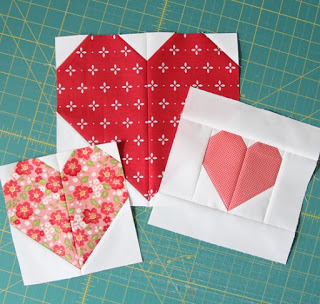 Cutting, Piecing, pinning, quilting, and binding. During the stream I will be accepting donations for St Jude (the link takes you right to St Jude, I never touch the money). For every $5 you donate you earn one ticket into my drawing. So what do you win? The quilt I make that day! As soon as I finish making the quilt I will immediately hold the raffle and award the quilt. 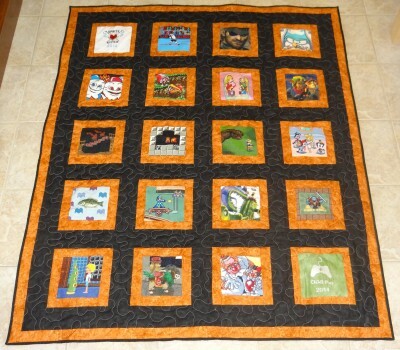 This will be a special one time quilt made only for this St Jude stream. I will also be holding giveaways throughout the day where you can win a quilt pattern, a bag of scraps, stickers, or a dice bag! So head over to my Twitch channel and join the fun!! Like many people I was shocked and hurt when I heard of the shooting in Quebec and mosque burning in Texas and my gut instinct was to try to help. I didn’t know what I could do until my friend Tracy Mooney from Generation Q Magazine had the idea of making prayer rugs. I have volunteered to be the collector of prayer rugs in Ontario. If you would like to contribute or know of a Mosque in Ontario , please feel free to reach out to me at toni@quiltoni.com. 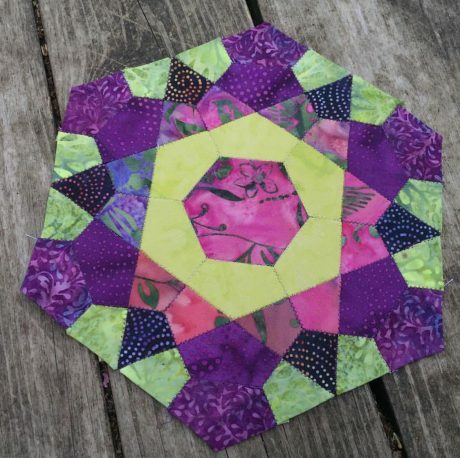 CAN A QUILT BE USED AS A PRAYER RUG? For every one of these events, and so many others, we’ve watched and participated as the call for quilts was rallied and answered. These quilts are always made and sent with the most basic of motives: to let the recipient know he or she is cared about. Regardless of religious/sexual/political creed or preferences, these quilts are simply offered as literal and figurative comfort. So last week, when a mosque was burned to the ground in Victoria, Texas, and six Muslims were shot and killed unexpectedly in a Quebec mosque, that familiar let’s-make-a-quilt impulse surfaced. That impulse got stronger for our senior editor Tracy Mooney as she watched news coverage of a local legislative outreach event in Austin, Texas. The event was Muslim Capitol Day, a day on which Austin Muslim school kids visit the Texas Capitol to learn about government. Two years ago, this event was interrupted by Christian extremists chanting “Muhammad is dead” and sabotaging the microphone to denounce the religious beliefs of this small group of Muslim American kids. As this year’s event date approached, there was plenty of concern about repeat harassment. About 500 people were expected to attend, and organizers were wary. Instead, 2,000 showed up, with hundreds of volunteers forming a protective human chain around the Capitol building so attendees could peacefully have their event. Tracy shared her thoughts with the Generation Q staff and with her friends on Facebook. To say the idea grew legs is an understatement. 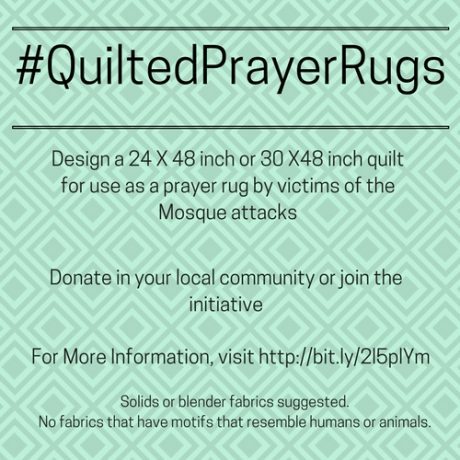 And so we are announcing the #QuiltedPrayerRugs initiative. Now, the Generation Q staff members hold very diverse political views and religious traditions. We don’t always agree on everything. But we DO agree that–at least for us–we often feel connected to God as we make quilts, especially for others. And we believe that connection finds its way into the stitches. Prayer quilts–sort of a sub-niche in the gifted quilt tradition–are not an innovation. Groups in countless churches and houses of worship in the United States and other countries make quilts that are blessed, prayed over and given to people struggling with health or life problems. A quilt used as prayer rug is merely a variation. And it is not a stamp of approval on any political view; it is a symbol that the recipient is cared about. Use solids or blender prints. Flowers and leaves are fine. Avoid fabrics that contain motifs that resemble humans or animals. Geometric designs would work beautifully, but any design is appreciated. Use bright colors. Green is considered spiritual. Cobalt blue is also a commonly used color. 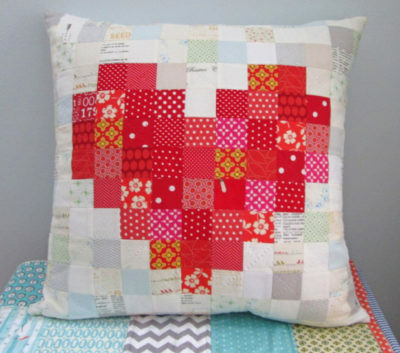 Finished like any quilt, with batting, backing and binding or fully enclosed edges. Dark fabric for the backing may be a good choice since the quilt will be laid on the floor. At this point, we suggest that donations of quilts be made to mosques located in your city or state. This way you can meet new people and find out what they really need and offer support. We DO want to make sure quilted prayer rugs get sent to Quebec and Victoria; complete details of that aspect are still developing. For now, please send these quilts to Lovebug Studios, 1862 E. Belvidere Road. PMB 388. Grayslake, IL 60030. We will keep you posted as to what the needs are as soon as we have more information. Email Tracy if you would like to donate funds for shipping. We will likely need approximately $10 per quilt to get the quilts to their recipients. 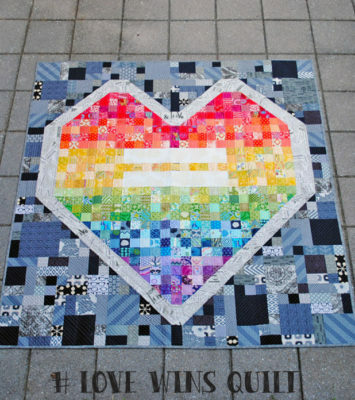 International author and quilt artist Linda M. Poole reached out after reading about the idea of prayer quilt rugs. She shared her own experiences with Turkey, a nation where the majority of the population is Muslim. “I was invited by the Minister of Culture of Turkey to represent America in their first Peace with Quilts quilt show back in 2000. Since that time, I have been back to Turkey four times to study the culture and the artworks, hence my first book long ago was Turkish Delights to Applique. I have been to many mosques to study them and also have many Muslim friends there,” she says. For prayer rugs, she recommends anything colorful and easily rolled up for carrying. If you would like to volunteer to collect quilts for distribution, please email tracy @ generationqmagazine.com. 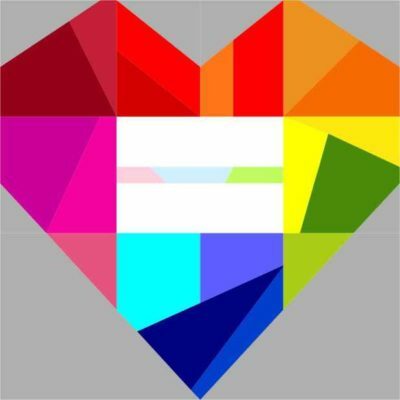 UPDATE: Toni Smith, of quiltoni.com and Craft Hackers, has volunteered to be the collection point for Ontario Canada. Contact her via email, toni@quiltoni.com. Quilt. Sew. Live. Breathe. Pray. I was recently introduced to Cuddle + Kind. We’re a family of five on a mission to help feed children in need. There’s nothing we love more than being parents. We think nurturing our three children is the most important, rewarding and sometimes challenging job in the world! With a background in health, we recognize the crucial role nutrition plays in a child’s development. As parents, we believe all children should have enough food to eat and the opportunity to thrive, so when we saw a documentary on the devastating impact of childhood hunger on millions of children around the world, it inspired us to help. On that day, we decided to start a company whose purpose is to help improve the lives of children and to make a difference. We’re proud that our dolls are made with natural, high-quality cotton because it’s important to us that they’re safe, soft and cuddly. We’re also super proud that every doll is lovingly handcrafted by incredible women artisans in Peru, providing them with a sustainable, fair trade income. Our whole family is passionate about what we’re doing and loves every doll we make. We sincerely hope you will too. I was excited to find a company that created hand made dolls (while providing fair trade income) that also supported such a worthy cause. The company and cause are great, but what about the dolls? At only $55 for the small and $75 for the large doll, the price is great too. I know first hand the hard work that goes into creating hand made goods. The price tells me that they are definitely hand made, but they aren’t charging too much. Take a look at their entire line of dolls and see if there is something you can do to help. I had the pleasure of listening to Carol Miller who works closely with Veterans here in my home town of London, Ontario. It was interesting to listen to the history of the veterans hospital and the issues facing them today. She was there to ask us to make and donate quilts to the Veterans of the hospital. Her talk got me thinking though about the other ways crafty people can help. There are of course many, many others that are just as worthy and amazing. But what about the other ways we can help if we don’t sew? Help Hospitalized Veterans (HHV) provides Arts and Crafts Kits that help recovering veterans by keeping their hands active and minds alert. HHV Craft Kits are uniquely designed to bring pleasure, healing and purpose back into the lives of veterans and military personnel. You can get involved and help Veterans receive these kits. There are a lot of great organizations that help soldiers and veterans. Take a look around your home town at the services and hospitals. They would love to have anything you can donate. If you are in the London, Ontario area, feel free to reach out to me to see how you can help us create the quilts for the Veterans in our city. A month ago I told you about the charity quilt the folks over at Sprite Stitch created using cross stitched squares. The raffle culminates today at 5pm est. Members of the Sprite Stitch community spent an entire year cross stitching their favorite video game scenes. These cross stitches were combined into two quilts. The first quilt was auctioned at the Penny Arcade dinner auction November of 2014. 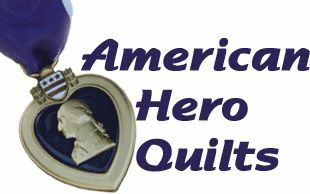 You have the opportunity to win the second quilt, a one of a kind creation valued at over $5,000. This is the fourth year these quilts have been created. No two squares will ever be alike from year to year. All proceeds from this raffle will go to Child’s Play. I will hold the random draw live through Hang With. If you would like to watch the drawing live log in to the Craft Hacker channel https://www.hangwith.com/user/crafthackers before 5pm est today. Or to be notified when Craft Hackers streams live make sure to follow us. Raffle tickets are only $3 a piece or $5 for 3 tickets. To buy your own raffle tickets or to view each of the squares close up look at the raffle here. You only have until 4:30pm est today to buy those tickets! Then I am creating the spreadsheet and setting everything up for the live raffle! See you tonight! It is that time of year when I do something with the second quilt I made that benefits Child’s Play. The raffle will be held Saturday August 8th at 5pm. I will hold the random draw live through Hang With. If you would like to watch the drawing live log in to the Craft Hacker channel at https://www.hangwith.com/user/crafthackers. Or to be notified when Craft Hackers streams live make sure to follow us. Raffle tickets are only $3 a piece or $5 for 3 tickets. To buy your own raffle tickets or to view each of the squares close up look at the raffle here.